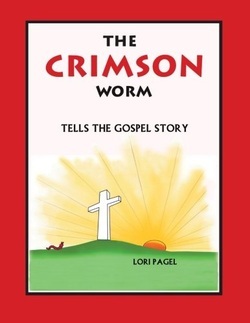 The Crimson Worm, Tells the Gospel Story. All through the Bible God has woven a scarlet or Crimson thread using this re-markable little worm to tell the story of the cross with its life. I was thinking about the verse in the Bible one day that says "the worm dieth not" and was wondering what that meant. Many times I look words up in the Greek or Hebrew to see if I can get a greater understanding for the verse. Well, I was surprised to find out that the word "worm" has two different meaning the Bible. One is about the worms we see every day, and the other is the Crimsom Worm. I had never heard about this before and I have been a Christian for 57 years. Once I started researching it I found there are many things written about it on the internet but nothing in book form telling this story and giving the references in the Bible. I gave a presentation to the ministers in our Division and they liked it so much they wanted me to give them a copy of it. Out of about 30 or more pastors and their wives, only one woman had heard anything about this and when I talk to people about it very few know anything about it. I decided to write down what I had learned in a book and help others to become acquainted with this wonderful story. If you want to do a more in-depth study of The Crimson Worm, feel free to visit The Crimson Worm website! This book is written in a child's format but has lots of content to it & could be used as a witnessing tool.